Summer 2018 is filled with a great deal of traveling for concerts with various incarnations of the ensemble Constantinople. On July 10th, we performed ‘Dalla Porta D’Oriente’ in the beautiful city of St-Gallen, Switzerland, with tenor Marco Beasley. Upcoming are performances with the outstanding clarinetist Kinan Azmeh in Sylvanès and Conques (both in France), July 22 and 27. 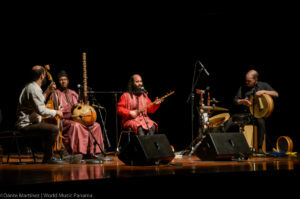 As well, Constantinople is performing in France on July 31 and August 1, with an all-star cast of musicians: Didem Basar, Neva Ozgen, Charbel Rouhana and singer Matilde Politi. We’ll return to Québec in August for concerts at the Domaine Forget and in Montréal for the Festival Ahuntsic en fugue. Laced throughout the months of June, July and August are also performances with the wonderful Senegalese musician Ablaye Cissoko. The first weekend in July, we spent three days the Førdefestivalen, in Førde, Norway. Our last performance consisted of two pieces for a live-broadcast gala concert at the festival, for Norwegian TV. You can see the video here (starting from 44:50). This entry was posted in News and tagged Constantinople, tour. Bookmark the permalink.